Charles Lockwood was born Midland, VA, 6 May 1890, and was graduated from the United States Naval Academy at Annapolis with the Class of 1912. He received his first submarine command, the U.S.S. A-2 (SS-3) in 1914. During 1919 he commanded the former German submarine UC-97, while it being tested to evaluate the capabilities of German boats. He also commanded the U.S.S. V-3(SS-165, Bonita) from 1926 to 1928. From February 1941 to March 1942, Lockwood served as American Naval Attaché to Great Britain. 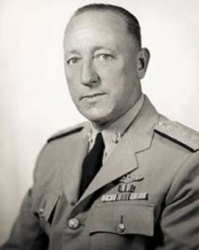 In April of that year he was posted as Commander, Submarines, Southwest Pacific, holding that position until February 1943, when he was called to Pearl Harbor to assume the post of Commander, Submarines, Pacific (COMSUBPAC) following the death of Rear Admiral Thomas English in a plane crash. In his new post, Lockwood was able to order tests of the Mark-14 torpedo and its Mark-6 exploder, which the operational commanders had complained was defective. One by one, the problems were found and corrected, and with an effective torpedo at last available, U.S. submarines went on to sink over 5.6-millions tons of Japanese shipping. This was more than half of the total Japanes tonnage sunk, and would probably have been a much higher percentage if the torpedoes had been properly tested before the war began. Lockwood passed away in 1967.